And Many of Them Are Free! Fountain Hills is a small, scenic desert community located east of Scottsdale and about 45 minutes from Sky Harbor International Airport. 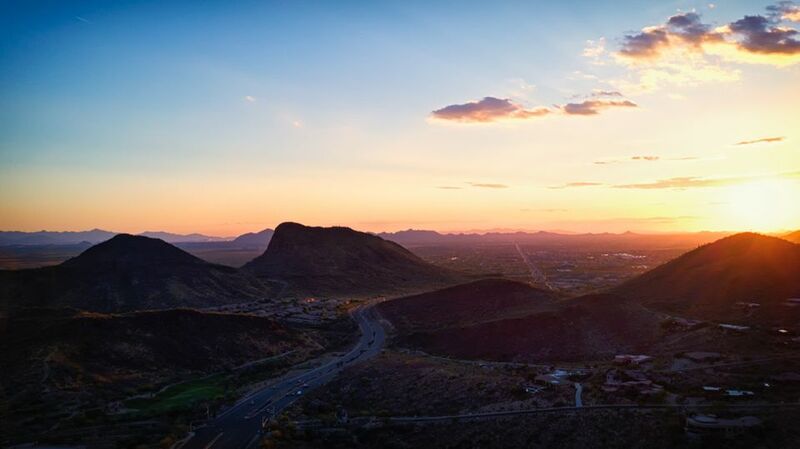 The town is surrounded by mountains with sweeping mountain views including Four Peaks, the Superstition Mountains, the McDowell Mountains, and boasts a natural desert landscape. Bikers will make sure that the scenic ride to Fountain Hills and Bartlett Lake are on the must-do list. Even though Fountain Hills is a town and not a city, and it is a relatively small community compared to some of its neighbors, there is still plenty to do there. With a name like Fountain Hills, of course, there is a fountain. But not just any fountain. Built more than 30 years ago, this dramatic landmark is a centerpiece of the town in Fountain Park. The fountain is located in the middle of a man-made 28-acre lake in the heart of Fountain Hills. One of the world's highest fountains, the 560-foot tall plume of water, shoots to the sky and is visible for many miles. Obtain an understanding of the history of Fountain Hills at the River of Time Museum. Small but sophisticated, this is one of my favorite community historical museums in the Greater Phoenix area. It isn't free to get in, but it only costs a few bucks. There are several beautiful golf courses in the lovely surroundings of Fountain Hills. Fountain Hills really knows how to put on a party! The Fountain Hills Great Fair takes place each February. Over 500 artists and artisans line the Avenue of the Fountains Boulevard and a variety of music and food make this Fair another 'must do' event for the Town. In March, guess what color the fountain turns at the St. Patrick's Day Celebration? Then, in November, you can enjoy the Fountain Hills Festival of Arts and Crafts. This Festival attracts more than 200,000 visitors every year to enjoy the artwork, the entertainment, the food and the hospitality of Fountain Hills. At Fort McDowell Adventures you can experience the wild west just minutes from one of the biggest cities in the country. Located on the 25,000 acre Yavapai Indian Reservation, you can enjoy horseback riding, cattle drives, hayrides, and much more. Enjoy boating and fishing? Saguaro Lake is close by! You can also take a leisurely, 90-minute narrated tour of Saguaro Lake on the Desert Belle. One of the favorite pastimes in the Phoenix area in the summer is riding an inner tube down the Verde and Salt rivers just southeast of Fountain Hills. Salt River Tubing & Recreation will help you have a great time on the river. Interested in camping, hiking, biking or horseback riding? McDowell Mountain Regional Park is one of the largest and most scenic recreational areas in Maricopa County. Fort McDowell Casino, adjacent to the We-Ko-Pa Resort, boasts the state's largest card room, classes, and free entertainment. Try your luck! Fountain Hills Community Theatre is a small, non-profit theater presenting shows throughout the year for both the general community as well as for children. Got a hankerin' for some cool jazz? September through May, Jazz in the Hills features local and national jazz musicians at various locations. Tickets are General Admission. Enjoy your visit to Fountain Hills, Arizona!